All footage and experiences of this Preview has come from Demo and Press outlets. The Demo was time limited to three separate 1-hour long play sessions over Friday 8th May and Saturday 9th May. As this Demo version is limited please do not use this as a review. This is a First, a Nintendo-built over the shoulder shooter, that isn’t a demo or minigame. In the past, Rare Studios (Goldeneye & Perfect Dark) and Retro Studios (Metroid Prime trilogy) have made shooters for Nintendo in the past. This is the first that an internal Nintendo team has made a shooter as the primary focus of the game. This game is very cartoony as they use ink instead of Bullets. As for Weapons use Super Soakers and Ink Rollers instead of guns and swords. Out of all the announced Multi-player modes as of yet, Splatoon does not include a “DeathMatch” Mode that most other Shooter games have. You play as an Inkling, or humanoid-squid thing. In Squid form you can move around alot and refill your ink, while in Humanoid mode you can shoot with the Super Soaker or use the Ink Roller. Your Inkling has access an ink consuming Sub Weapon, usually a mine or a Paint Bomb of sorts, and also a Super Weapon that must be charged by using the other weapons. 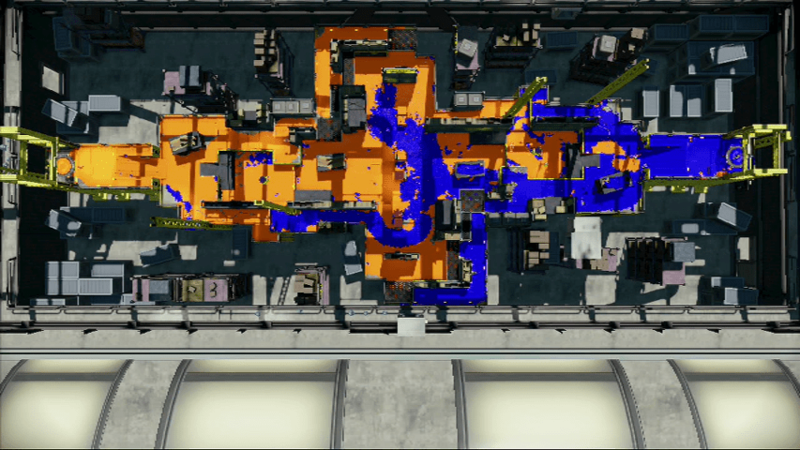 This demo only showed of the Multiplayer mode with two maps, SaltSpray Rig and Walleye Warehouse, in the unranked Mode “Turf wars”. In addition, only 4 Sets of Weapons were available. Turf Wars unlike most FPS, doesn’t reward for making kills, but for covering the floor with your colour of ink. Making kills does help, as the other team will be down a Inkling for a few seconds, allowing your team to paint the area in your colour. 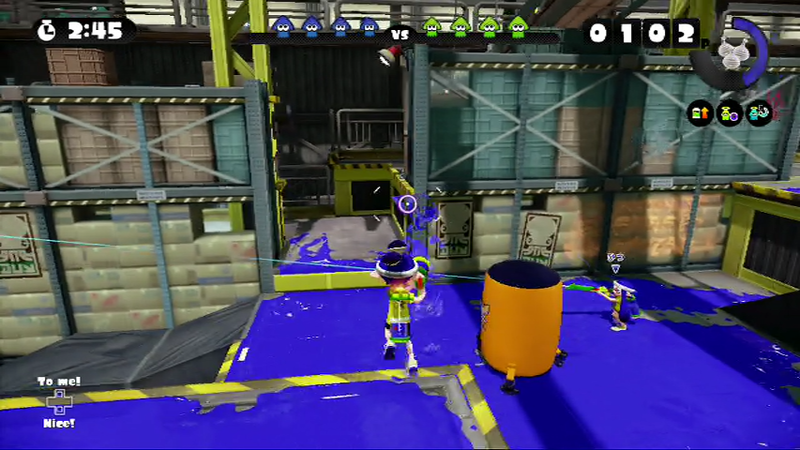 Also the Inking you just dispatched will have Splatted the area in your ink colour. The Map at the end of a round. Orange wins! After the match the game totals up how much ground you covered in ink and determine a winner. It’s possible for a team that constantly gets kills not to win. The Killer Wail in action with the Splat roller. The SplatterShot, is the standard “Assault Rifle” or SMG in most games. It range is limits your fights to relative close range, but has some allows for some good ink coverage. There were two variants of this weapon in the demo. The weaker of the pair had a Bomb sub weapon, and a Shield super weapon. This shield could be used with team mates in close combat. The Stronger weapon (Super Soaker), had a Water balloon as a Sub weapon, and the Super Weapon allowed you to throw multiple water balloons at in quick succession. 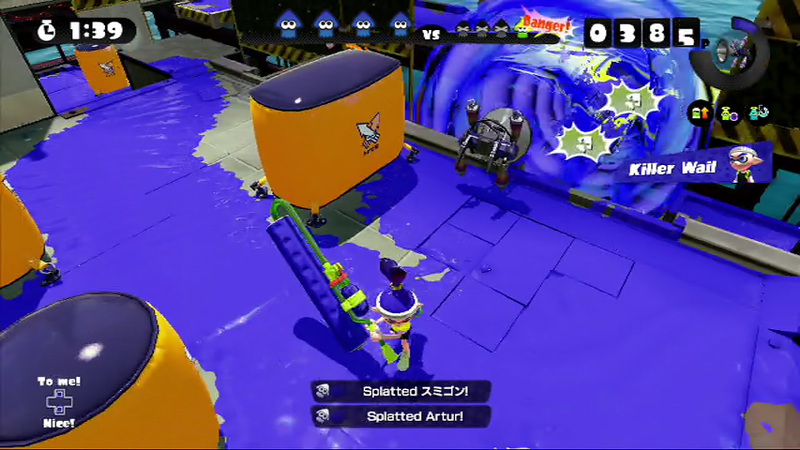 SplatterShot spraying a area, while “Hitsu” aims with the Splat Charger. The final weapon choice is the Splat Charger, equivalent to the Sniper rifle in a standard FPS. This weapon has the longest range with the drawback of low ink coverage. This Weapon requires a charging before firing. To help aim, a Laser guide is activated, but this is a double edged. Everyone can see your laser sight, so your potential target can avoid getting shot at. In the demo, A bomb Sub weapon, and Multiple bombs as the Super Weapon. 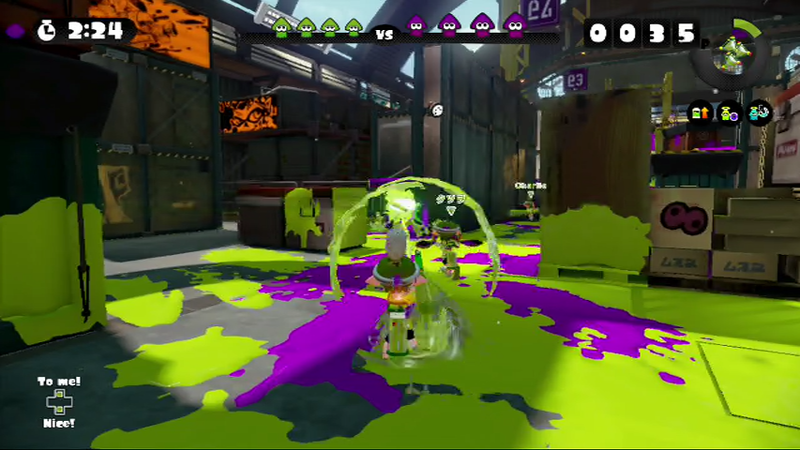 A Splat Charger about to take a Purple victim. The Splatoon uses both the TV and Screen on the Wii U Gamepad. The GamePad is sold with every Wii U and is expected to be used for play. The Wii U Gamepad has Motion controls like the Wii Motes from the Wii. Movement is done with the Left stick, and Jumping with the X button. To turn in to Squid form by pressing ZL. Firing is done by ZR. The Equivalent buttons to ZL and ZR on the other consoles controllers are the Xbox Triggers or Playstation’s L2 and R2 buttons. To aim you use the move the Wii U game pad. This is very similar to motion control options in several Games on the 3DS and Playstation Vita. The Right stick can also be used for aiming. If you prefer the classic controller options commonly provided on the other consoles, there is an option to change the setting to not use motion controls. The Map is shown on the Game Pad with areas painted updated in real time. Squid icons show where a team mates are, and what direction they are facing. By Tapping your team mates status, you can “Super-jump” to the that person’s location. Until this section, I’ve kept my opinions out of this. Some of this down to the my style of review, and most of the issue isn’t to do with actual game play. I chose to stay using the default Motion controls options. It is responsive and allowed to aim with ease, even with the Splat Charger. I was able to hit targets quickly and accurately. The Game pad, while under half a Kilogram, still ends up tiring the arms out when playing in some cases, which could limit play sessions. Most other Wii U games that I own don’t use Wii U Gamepad’s Motion controls for a extended periods of time, with the exception of the exercise game Wii Fit U. The option to use the “traditional” twin stick method is available, but some players would have liked to used the smaller game pad. Tutorial about Aiming with the Wii U Gamepad. The Main issue is that being a “online PvP shooter”, that large amount of time will require you to play against other players. This requirement of having other players online, is itself an issue. The game can be kept going as long as the players are playing, could make or break the game. Using the PC MOBA-shooter Super Monday Night Combat, as an example of an unsuccessful PvP Shooter. To get a “proper” game going you need 10 players, sadly very few people are on, that a proper matches hardly get going. To echo this median amount of playtime for play sessions is less than 10 Minutes in the last two weeks, where most players have given up and quit the game. That the only reason that people are still playing the game at all, is down to certain points in progress in SMNC, will give hats in Team Fortress 2. A lot of this is probably down to developers stopped updating, and not rotating the roster available for free. Nintendo has added a local PvP Mode, where one player Vs another is available, as well as significant single player mode, both of these can provide some playtime after the online mode has gone. At the current time, Nintendo have announced things planned for after release to keep players interested. Nintendo’s big online games have either been good offline games that have online modes to enhance the game. There is one final thing to add, SMNC’s was also up against several similar games on the PC which are also free, Splatoon being the unique and against a lot less competition on the Wii U. Time will have to tell if we’re still be playing Splatoon in several years time. Next Next post: Could Nintendo’s NX be Android?